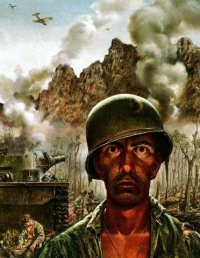 Witnessing the death and pain of war can leave deep scars on the psyche of a soldier. Those scars are more commonly known as being PTSD related symptoms. In 2008, the RAND Corporation estimated that 300,000 returning troops currently suffer from PTSD and depression related to combat duties. Losing faith can have devastating effects on the mental health of returning soldiers. A 2004 study which included 1,385 veterans found that their experiences of either witnessing or failing to prevent a death in combat weakened their religious faith and increased feelings of guilt. Dr. Alan Fontana and Dr. Robert Rosenheck found that the severity of the PTSD symptoms and social functioning had no bearing on whether or not vets sought mental health care. So, why did they seek help? The researchers in this study concluded that those veterans who sought help for their PTSD were driven to do so as a way to tend to their feelings of guilt and loss of faith. Connecting the two concepts of religious and spiritual beliefs and meaning of life, the authors of this study suggest that veterans’ pursuit of services for their PTSD may be a search for meaning and purpose to the trauma that they experienced. What happens to someone when they no longer can or will believe or have meaning and purpose in their life? Would losing all of this make it more difficult to recover from the initial trauma? It is a possibility. Researchers, Jill Bormann, Lin Liu, Steven Thorp and Ariel Lang conducted a six week study with veterans to find out if restoring belief, meaning and purpose in their lives would aid them in their recovery. The study involved 66 combat veterans self-reporting with PTSD symptoms. They participated in six weeks of case management and group mantram practice. The veterans were given training on using a mantra practice which is the repetition of sacred words that works to focus attention and is believed to create spiritual transformation in the practitioner. Mantras are a way of prayer, a way to connect to God or a higher essence that is either seen as being within oneself or outside of self. The mantras were selected from the Strength In the Storm and given instruction on the practice. Their classes answered any questions they had and provided a space for discussion of the practice and their personal experience with it during the course. Veterans practiced this during periods of their days that were not stressful, usually in the early morning and just before sleep hours. Over a six week period the researchers found that there was a significant decrease in reported PTSD symptoms in those veterans practiced the mantras. They showed an increase in their existential spiritual wellbeing which means that somehow they found renewed meaning and purpose as well as a knowing that it was all going to be okay. Wonderful and hopeful. The mantra practice may have given them a sense that there is a higher power or inner strength that is there to help them overcome their pain. The practice opened them up to a greatness that will support them in dealing with their trauma. The power of words can shift consciousness and reinforce personal sense of purpose and help to restore meaning in their lives. Dr. Stanley Krippner and Daryl Paulson have written on the alternative ways of seeing and treating PTSD. They have written about the benefits of mindfulness and mediation in their book Haunted By Combat: Understanding PTSD in War Veterans. Bormann, Liu and Thorp came to a similar conclusion, mindfulness and meditation can help to reduce symptoms and increase overall existential wellbeing. Hopefully, more research with this particular intervention. VA hospitals rely heavily on empirically based interventions. The more research like this, the more likely that veterans will have access to the type of care that is beyond the pill — that will reach deep into their hearts for true and lasting healing.